My mom is THE plant whisperer, rescuing any plant from the brink of death. But, the apple falleth far from the tree. Cursed with a black thumb, I am not going to tell you that I have found the magical touch or show you how to successfully nurture a fiddle leaf fig (aka The Devil’s Spawn…seriously those plants, while glorious and beautiful, are impossibly fickle). Instead, I want to show you how to create a simple yet amazeballs faux succulent centerpiece. I’ll also share some of my top picks for faux arrangements that are perfect for shelfies, consoles or office spaces! When I posted this simple centerpiece I put together, I received so much positive feedback and source questions on how to recreate the look. Its a great way to decorate for the season, yet it is appropriate all year long. So let’s get to it! First, choose the correct size vessel. I wanted an oversized dough bowl but you may want to go smaller (perfect to help style a console or bedroom dresser) or even choose a different shape (round bowls will work too!). Mine doesn’t have any handle details but I am majorly crushing on ones that do. Position the candles in your bowl. I do not plan to light the candles, but you can make your succulent display functional by using the battery operated LED candles or putting your wax candles in glass hurricanes first. Another alternative to plain white candles (and something that would be very fall appropriate) would be the birch wrapped candles. 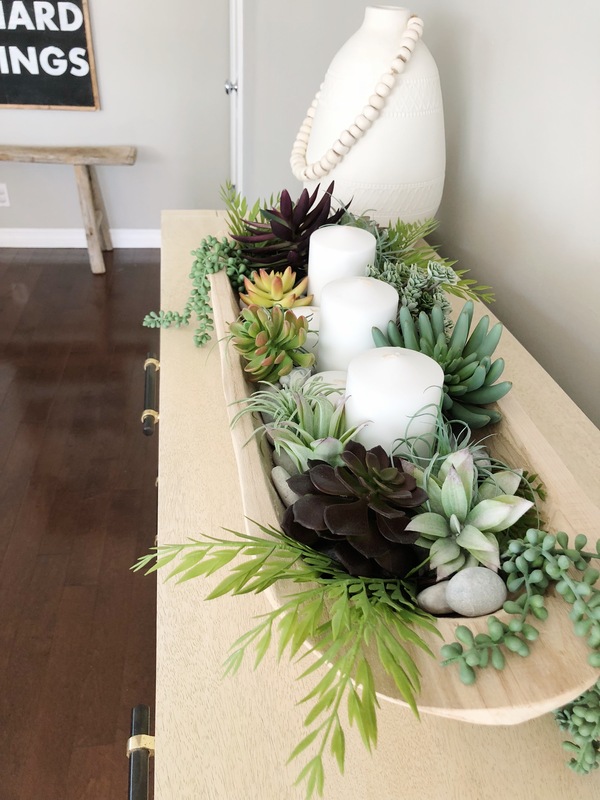 You may be surprised how space fillers like sand or river rocks can really elevate the whole look by filling in the gaps between the succulents. Even add some preserved moss or bark elements to throw some real into the mix. It’s the small details that make all the difference. Now on to the good stuff. There are so many pretty faux succulent options nowadays and I’ve rounded up my faves. Mix and match colors and sizes and don’t get all cross-eyed about it…they are succulents, they WILL flow nicely together! The selection at Crate & Barrel is top notch and while I’ve never seen the Terrain ones in person, they offered unique ones that were too stunning not to include. So go eighth-grade gymnasium dance or go full out prom-mode when making your picks! Both will be a good time. More times than not, I have loved so hard on my real succulents that they literally burst (aka over-watered them and they exploded). So, sometimes you just need to go faux! And here are some beautiful options to put on your shelf, console, office space (cubicles need greenery too!) or even hang them as wreaths! I picked the most realistic ones with the best pots. This is awesome Erin…did you come up with fauxtastic succulent? It’s brilliant!